The Playwork IN Nature Training Program trained individuals in basic playwork approaches for working with children in institutional and public settings where engagement with nature is the primary vehicle for creative enjoyment and healthy child development. In countries such as Germany, Japan and the United Kingdom, playwork is well established as a profession… working directly with children in an open-ended, creative way in community settings such as parks, schools, museums, urban farms, etc. Playwork is not established in the United States as a profession. The Natural Learning Initiative is working towards this end. 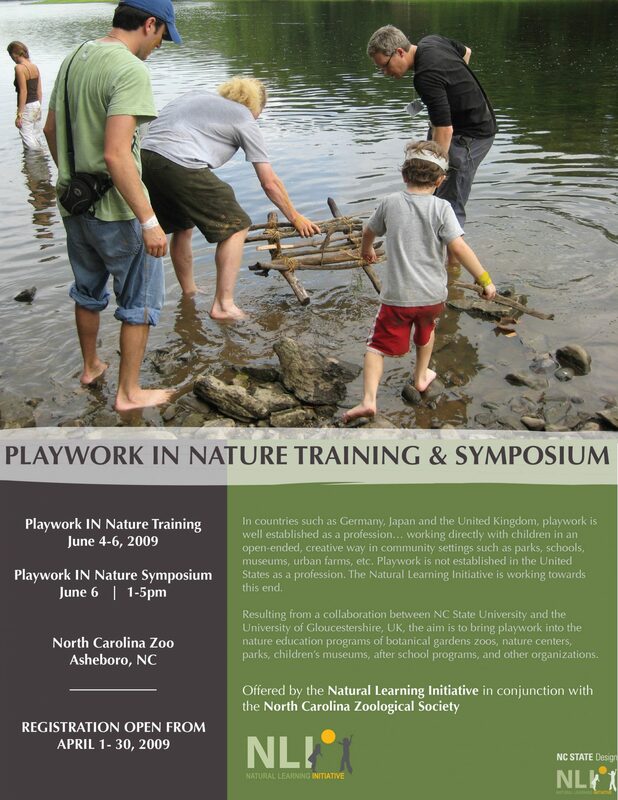 Resulting from a collaboration between NC State University and the University of Gloucestershire, UK, the aim is to bring playwork into the nature education programs of botanical gardens zoos, nature centers, parks, children’s museums, after school programs, and other organizations. We shared personal anecdotes about nature play from our own childhoods, learned about natural affordances and constrained action, explored how to build relationships with kids, discussed how to overcome obstacles of working with different types of institutions, fantasized what the world would be like without play, considered risk management in children’s environments, reflected on the attributes of an effective playworker – and how to play with sticks (video), among many topics.